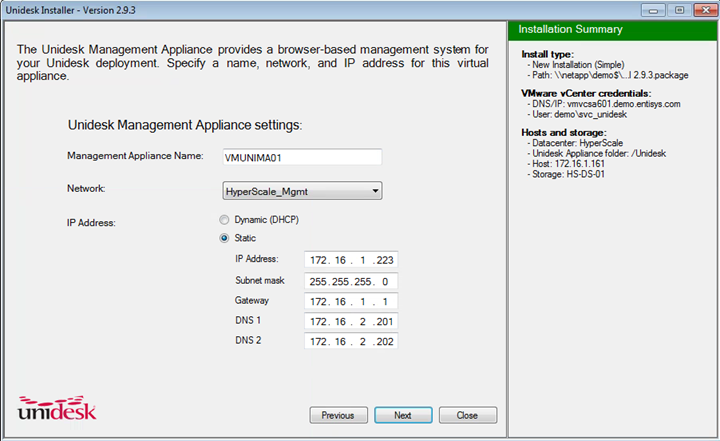 I’ll enter the Management Appliance name, network switch to use and a Static IP Address, Subnet, Gateway and DNS. 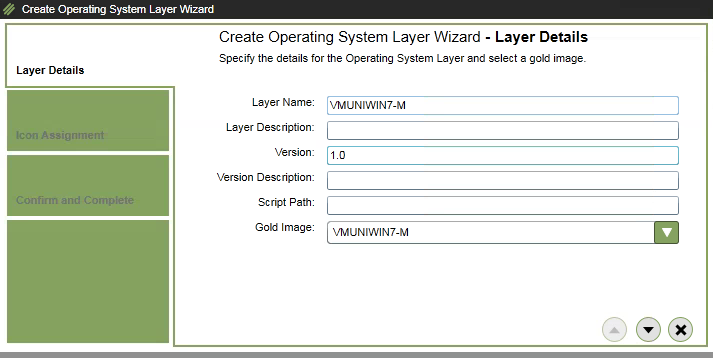 After about 10-15 minutes, the OS Layer will be ready to use. 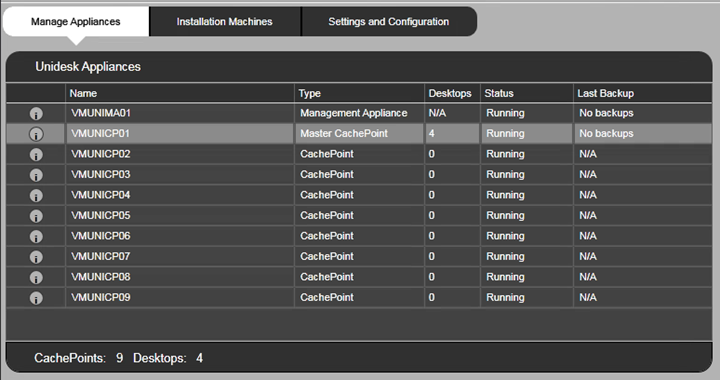 While we wait, we can configure a couple other pieces of the infrastructure. 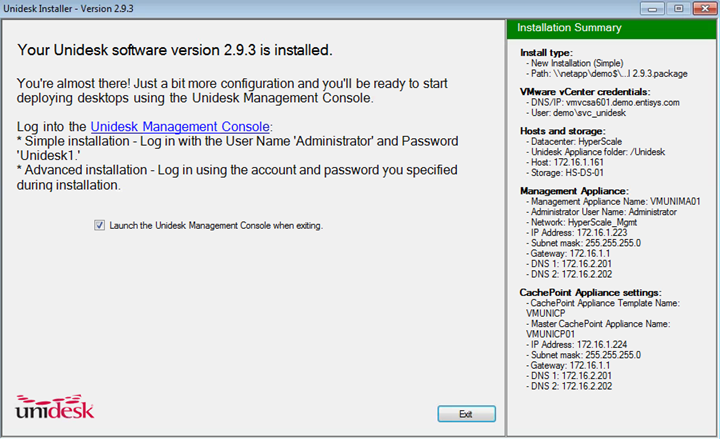 I’ll be using AppSense Environment Manager to provide User Environment Management and personalization to both persistent and non-persistent virtual desktops. I’ll be doing some scalability and performance benchmarking against the environment. 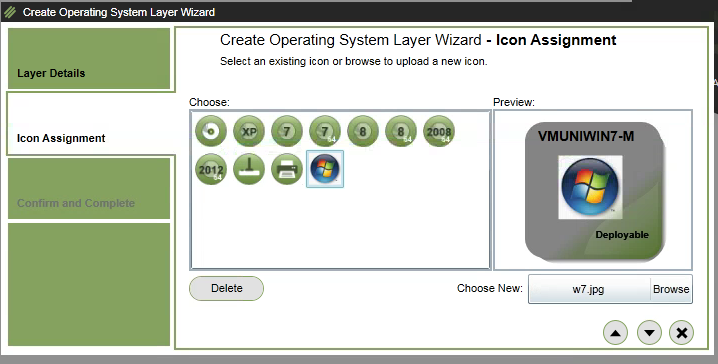 The Login VSI layer will include a couple other applications including Adobe Reader, Flash, Doro PDF, Java, etc. 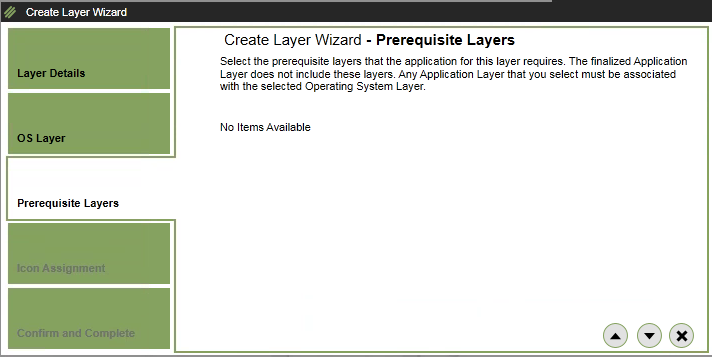 Layers will be similarly configured (with exception for Microsoft Office which needs 20GB). 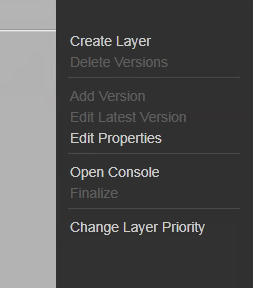 Here are some sample steps for the layer creation process. 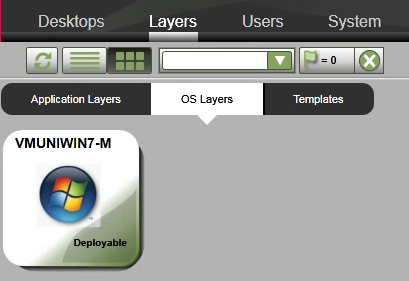 This indicates that the W7 Login VSI layer is attached to VMUNIWIN7-IM4 (See above). 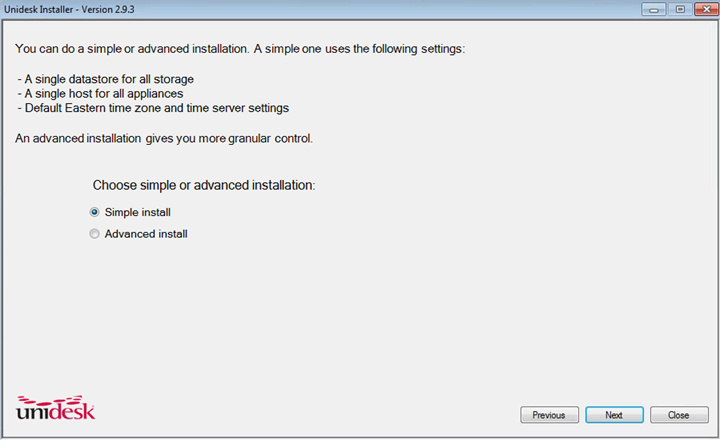 Installation of nearly all applications are exactly as you would expect for a native installation. 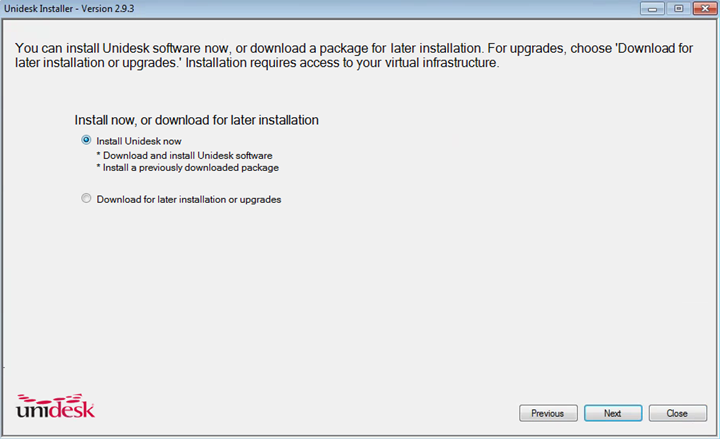 If an application requires multiple reboots, I’d recommend you perform those prior to finalizing. An example would be Microsoft Office which currently downloads the entire internet as part of the Windows Update process. Multiple reboots are required there, just keep doing them until Windows Update shows up to date! 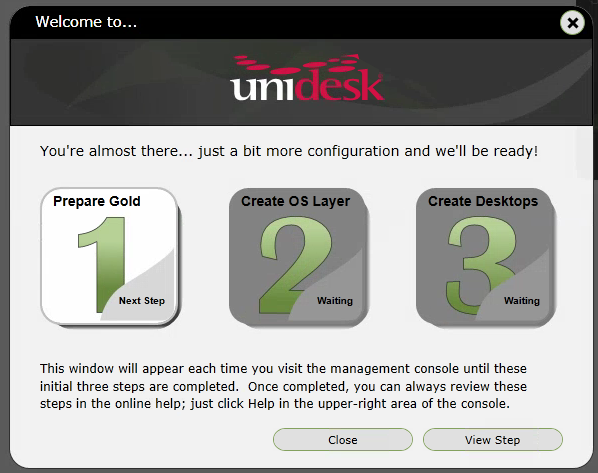 The Unidesk guide recommends not to run the OS Optimizer as the Gold Image was already optimized by Unidesk, but I disagree with this recommendation. 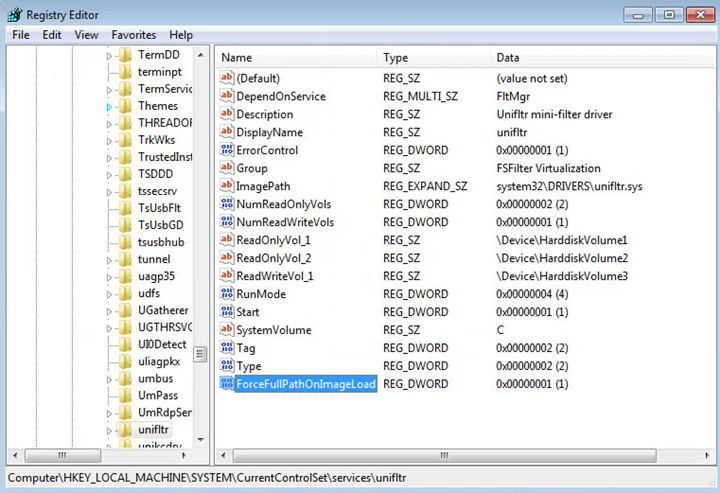 Particularly if defaults were selected when using Unidesk’s optimizer. If anything, I would recommend two Application Layers for the Citrix XenDesktop VDA: One for Persistent Unidesk desktops, and one for Non-persistent Unidesk desktops. 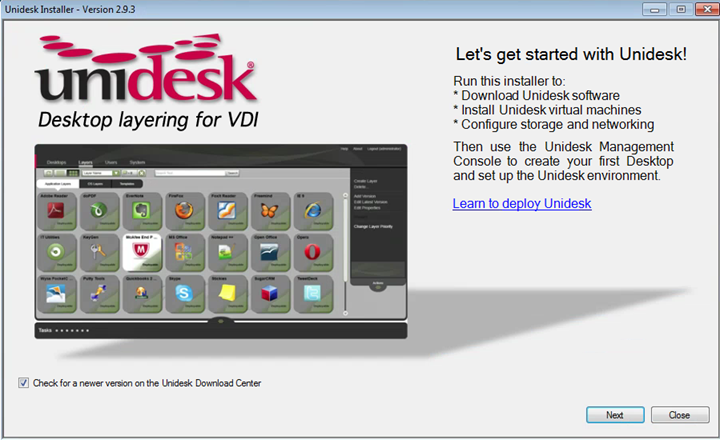 The OS Optimizer is VERY useful for non-persistent Unidesk desktops, even when the Unidesk desktop optimizations were run. 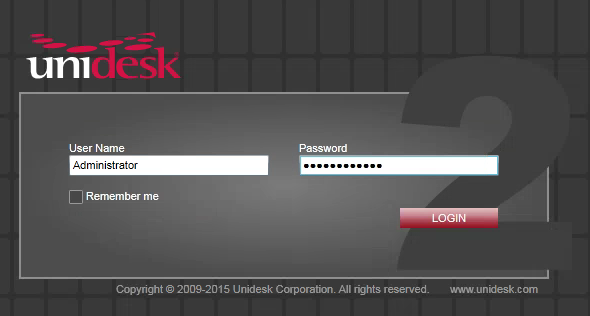 The default Unidesk optimizer does not disable several key services that create a lot of background work for non-persistent desktops. 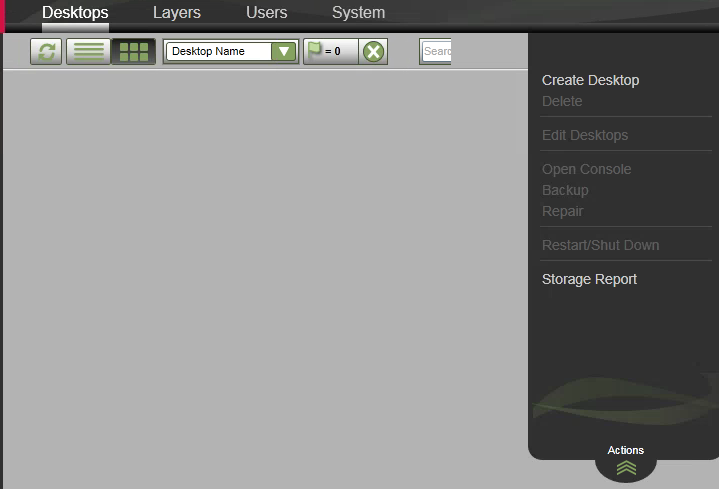 Once all layers have been finalized and show as Deployable, we’ll get ready to deploy some desktops! First, we need to create two templates. 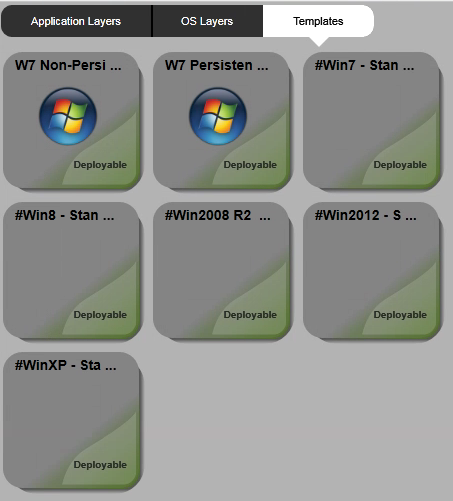 One for XenDesktop Persistent (Existing Static), one for XenDesktop Non-Persistent (Existing Random). 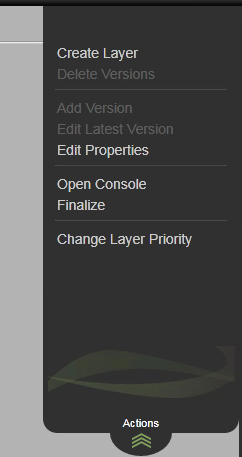 Navigate to Layers -> Templates. 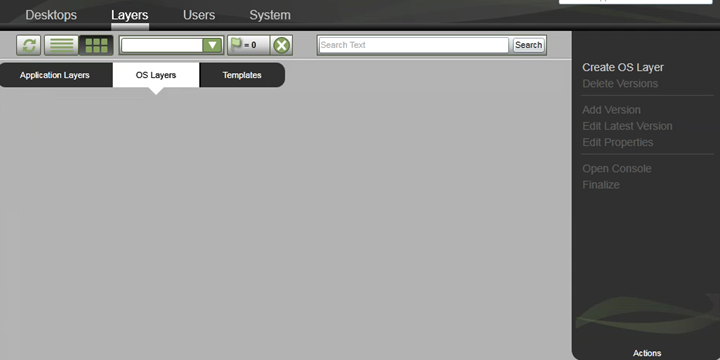 Click Create Template. 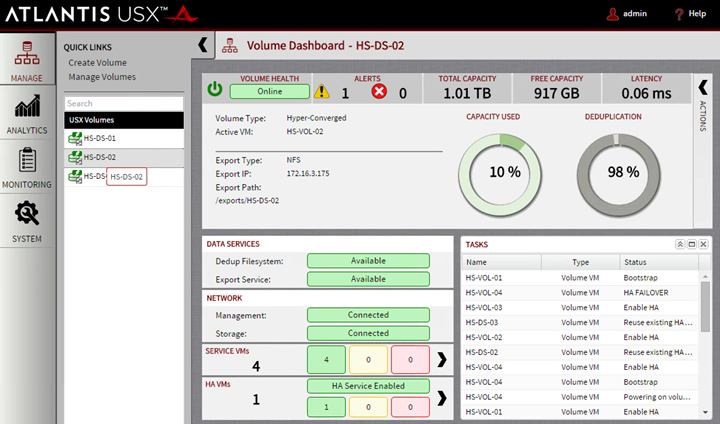 Each of these volumes are capable of delivering 50,000+ IOPS (4KB, 80% random, 80% write) and 250MB/s+ throughput. 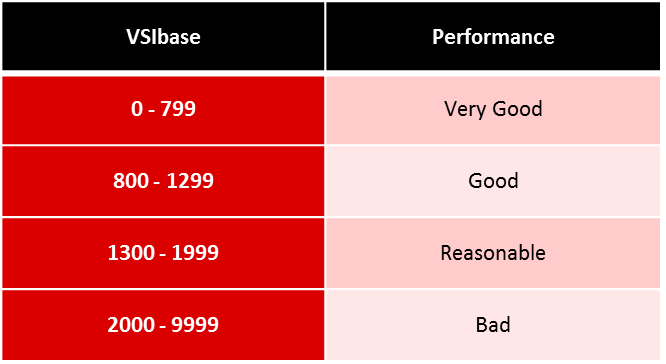 Since these volumes are backed by incredibly fast performing local SSDs in the four nodes, we have quite a bit of performance capabilities to leverage. To make the most of the available performance and to minimize deployment, BIC, re-BIC and application layer deployment times, I’d highly recommend deploying three CachePoints per datastore, or a total of nine (9) across the HyperScale 4-node cluster. 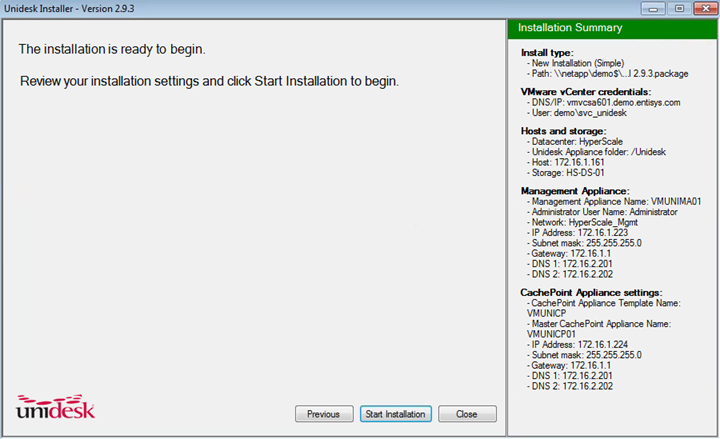 This recommendation is based on my testing to scale up to 500+ desktops per 4-node cluster, mileage may vary. 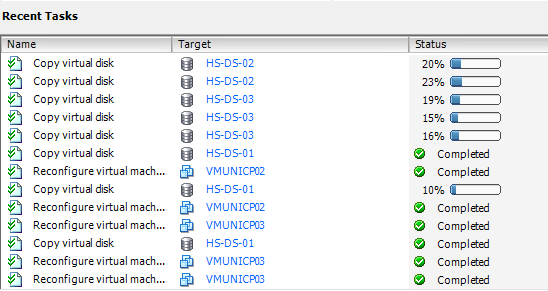 Overhead for each additional CachePoint is minimal and the VMDKs are all de-duplicated by Atlantis, so you’re really not losing anything by scaling out the CachePoints in this manner. 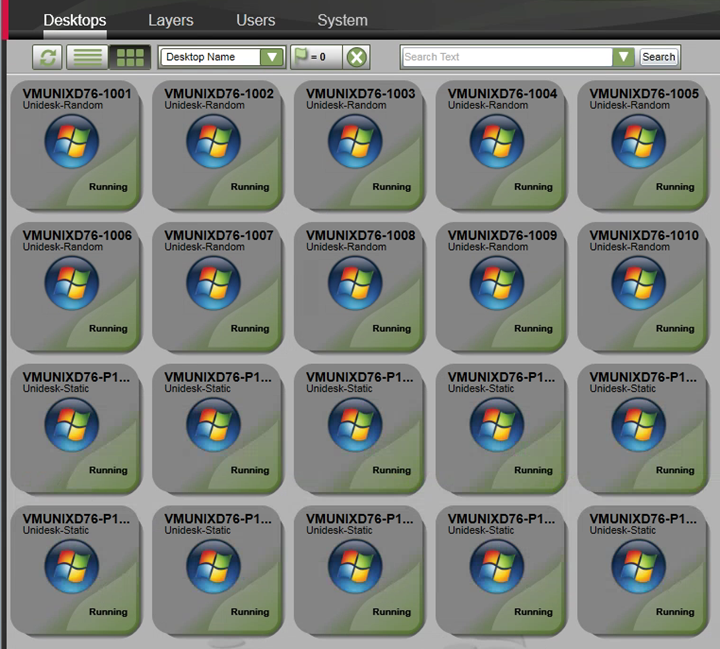 Next, I’ll repeat the same process again, this time creating 10 Persistent desktops. For the persistent desktops, I’ll configure all settings identically to the non-persistent group except I expect the user resource requirements to be a little higher, so I’ll allocate 2 vCPUs and 4 GB RAM. Also, I’ll set the persistent disk size to 20GB as discussed previously. When configuring CPUs, be sure to select 1 CPU Socket with multiple Cores Per Socket for NUMA performance and HAL reasons. 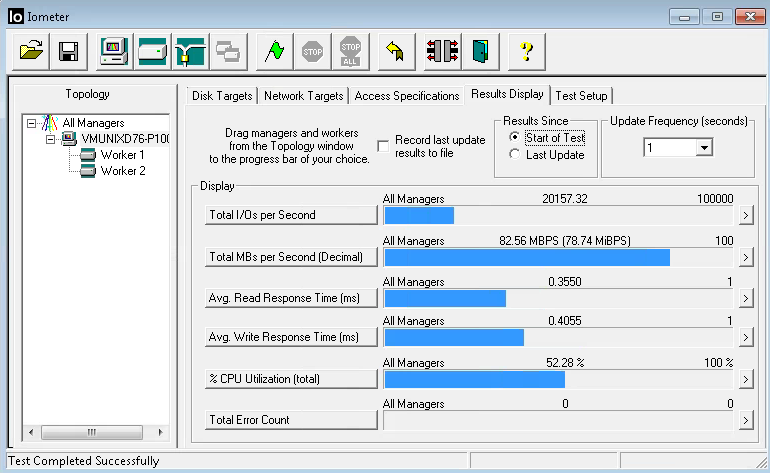 A single VM with two disk workers is able to produce 23,000+ IOPS and 96MB/s throughput at .3ms read and write latency (4KB, 80% write, 80% random). I know a couple users that would be ecstatic with that performance. 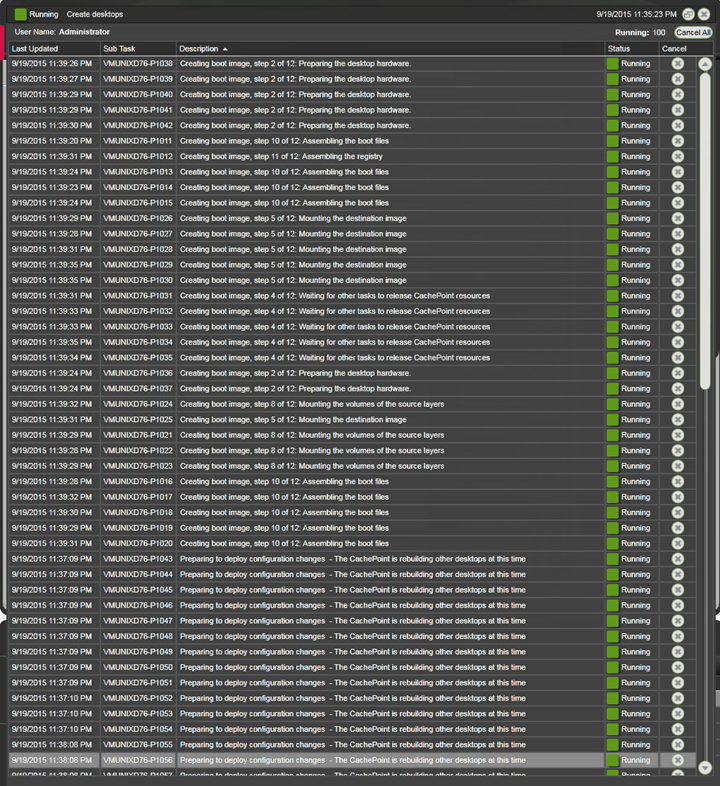 For the final HyperScale/USX and the CachePoints test, the last step is to deploy a pool of 100 persistent desktops. Unfortunately this is the top end of my partner license at the moment, additional testing and scaling to 500+ desktops will require an updated license for testing purposes. 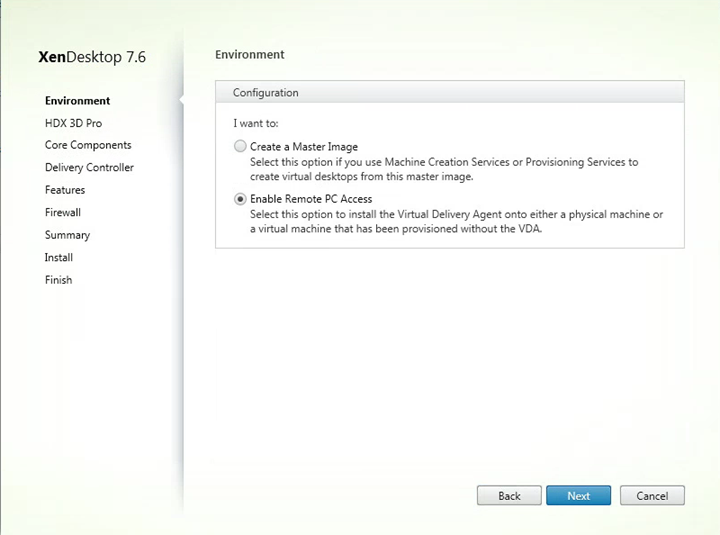 I’ll follow the same steps I performed to create the initial 10 desktops. 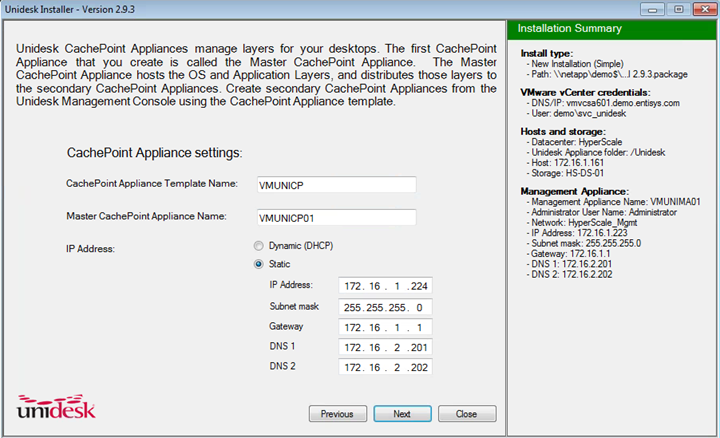 While the desktops are being created, observing the task details shows 30+ simultaneous operations based on the number of CachePoints deployed. This is great! Since all of the OS and Application layers were copied initially, network throughput for creating additional desktops is minimal in perspective, spiking and peaking to a mere 479MB/s at times (strong sarcasm, this is still smoking fast!). 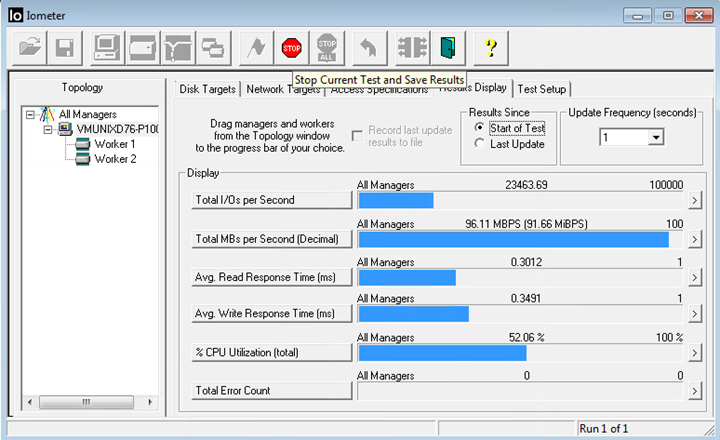 As you can see, IOPS and throughput decreased, but still VERY good performance relative to other environments. 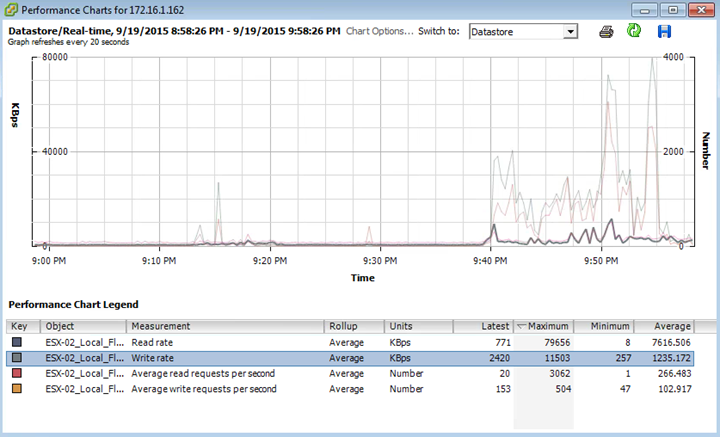 Previously, IOPS were 23.5k, now they’re 20k. 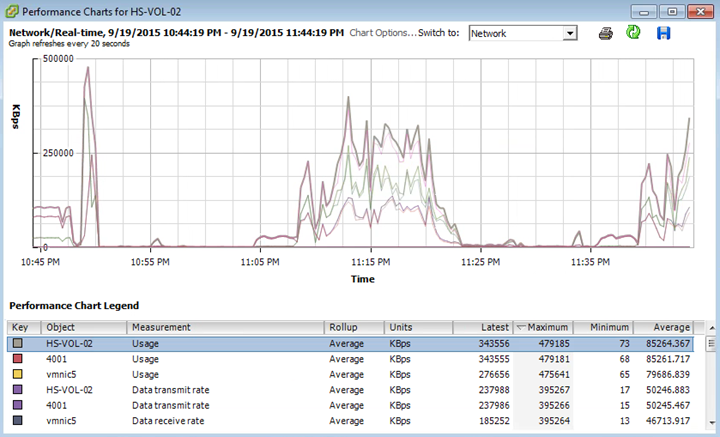 Throughput was 96MB/s, now 82MB/s. Latency is still pretty decent (not higher than .5ms). Most importantly, this desktop is still fully functional and not impacted by the Unidesk noisy neighbor affected created by deploying additional desktops. 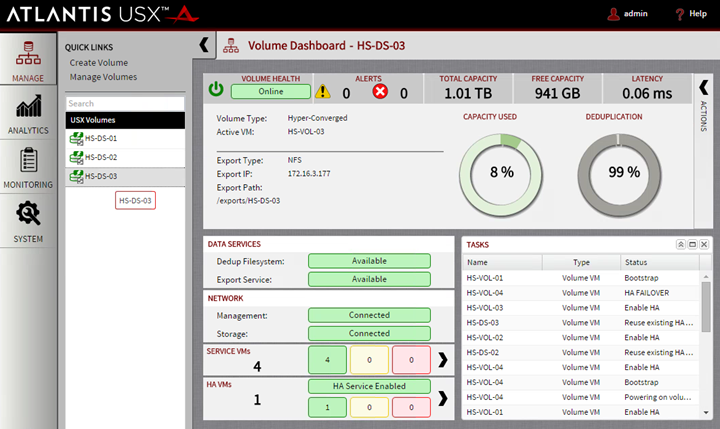 Do you have the same level of confidence in your current storage solution? J Change management constraints aside, I know many environments that are terrified to death simply to reboot desktop VMs during normal business hours. 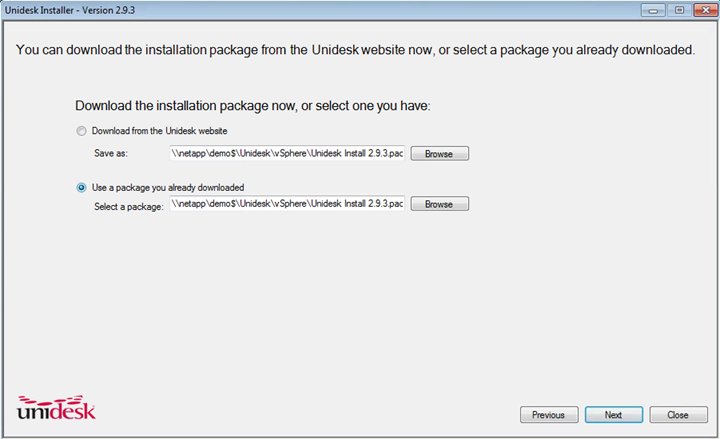 Pretty impressive given the amount of hard work and heavy lifting that transpires in the Unidesk deployment process. 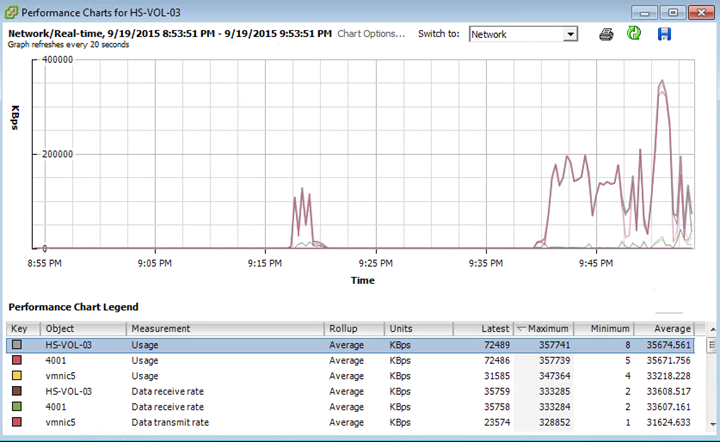 As just a quick sneak peak, here’s some preliminary testing data against the 10 desktop persistent pool using Login VSI knowledge worker workload, AppSense Environment Manager for personalization, Citrix XenDesktop 7.6 VDA, and Microsoft Office 2013. 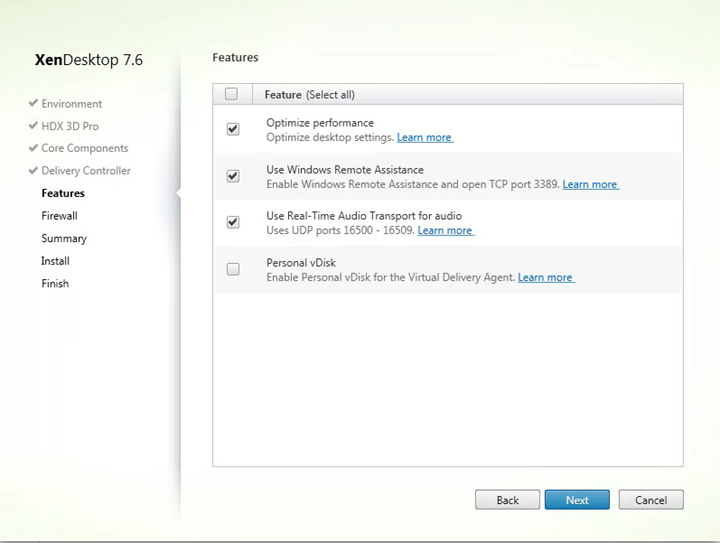 In the View Reference Architecture, Atlantis demonstrated a VSIbase of 774 using Windows 7 Full Clone virtual machines, 2 vCPU / 2 GB RAM. Full Clones are undoubtedly the best performance achievable as there’s no imaging filter drivers getting between the VMs and storage. 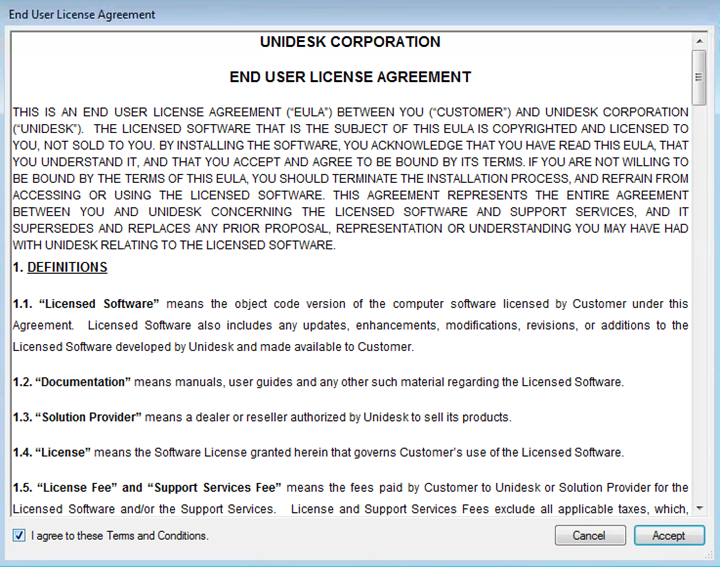 The fact that I was able to achieve a VSIbase of 790 with Unidesk and AppSense in the mix is truly remarkable! Let’s put this baseline number into perspective from user experience point of view. 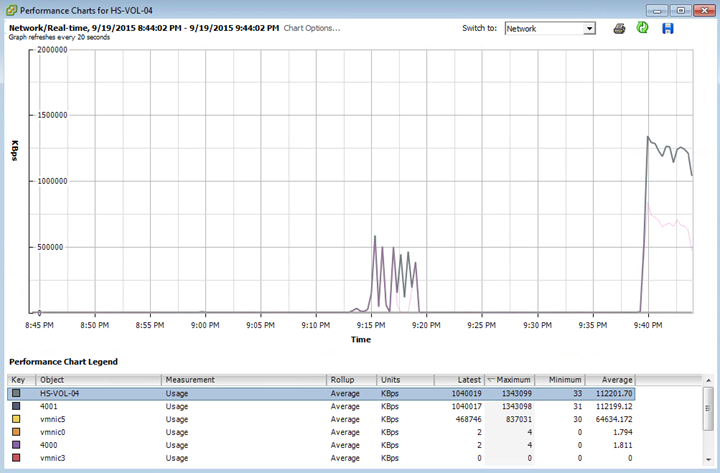 while I was running the Login VSI tests, a quick stop watch sanity check showed login times were consistently 10 seconds or less from the first Citrix ICA client dialog to desktop ready state (Wallpaper and Start Menu visible). This is truly an incredible performance demonstrated by the combined hardware and software solutions. 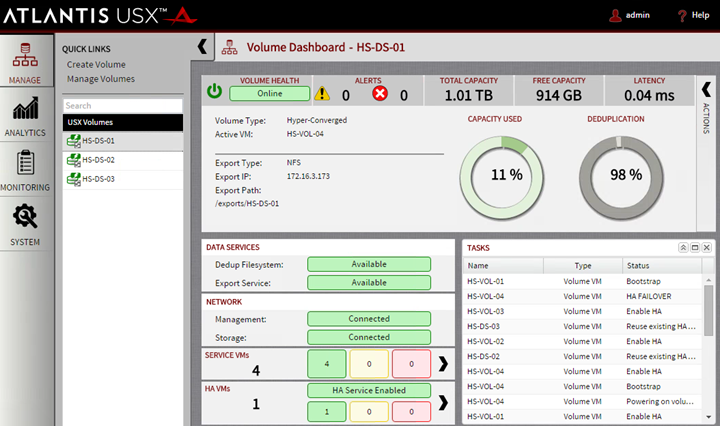 Let’s take a look at the storage capacity impact of combining Atlantis with Unidesk. One of the key value propositions of Unidesk is their ability to cut down on storage for gold images, OS layers, and Application layers. I have to agree, this is pretty cool, opening up possibilities to use otherwise extremely expensive $$/GB storage hardware. 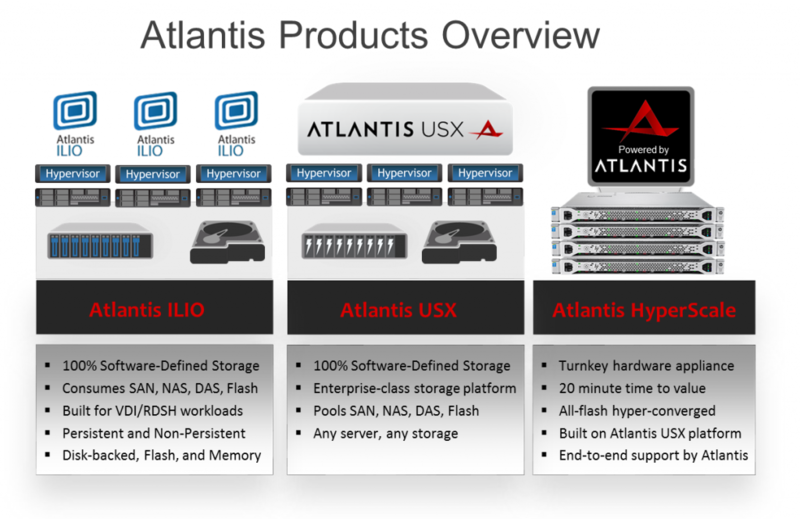 Hopefully I’ve demonstrated throughout this deployment guide that Atlantis HyperScale and USX are more than up for the challenge, delivering some truly incredible performance results. But what about capacity? 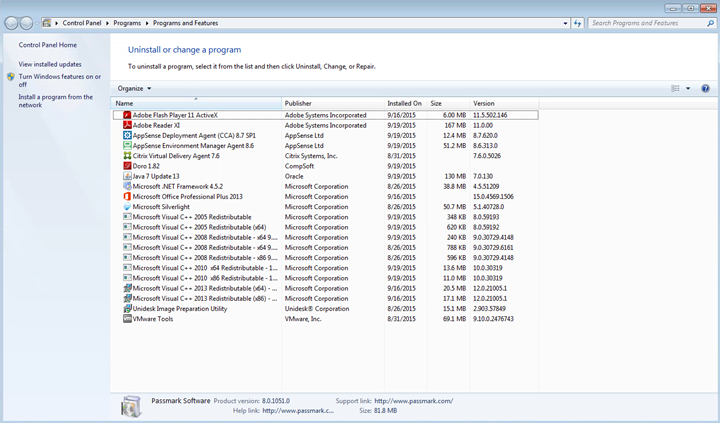 In my example, each persistent desktop was allocated 20 GB of storage to start. 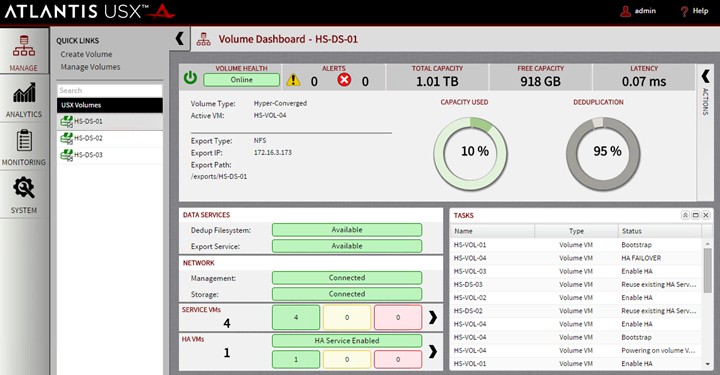 There are a number of indications on Unidesk forms that show that running out of capacity in a datastore or cluster supporting Unidesk can be a real pain in the rear. Based on my testing, I’m nearly 100% confident this wouldn’t happen with Atlantis HyperScale and the abundance of capacity. Atlantis will do a pretty good job of making sure that user data and layer changes over time stay in line, de-duplicating and thin provisioning real-time to reclaim any storage capacity possible. Pretty impressive! Unidesk assumes thin provisioning, so in my experience this number is a little low if you assume thick provisioning on VMFS and backend storage LUNs. 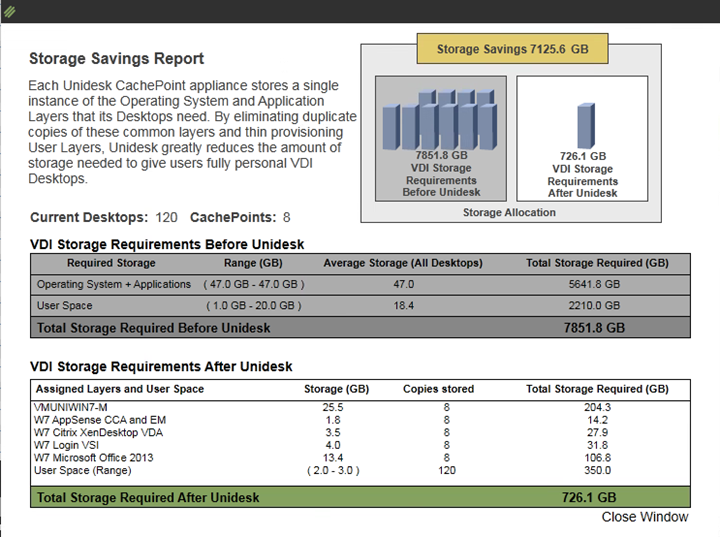 Thanks Unidesk for saving my over 7TB of storage space! Let’s take a look at what Atlantis says. 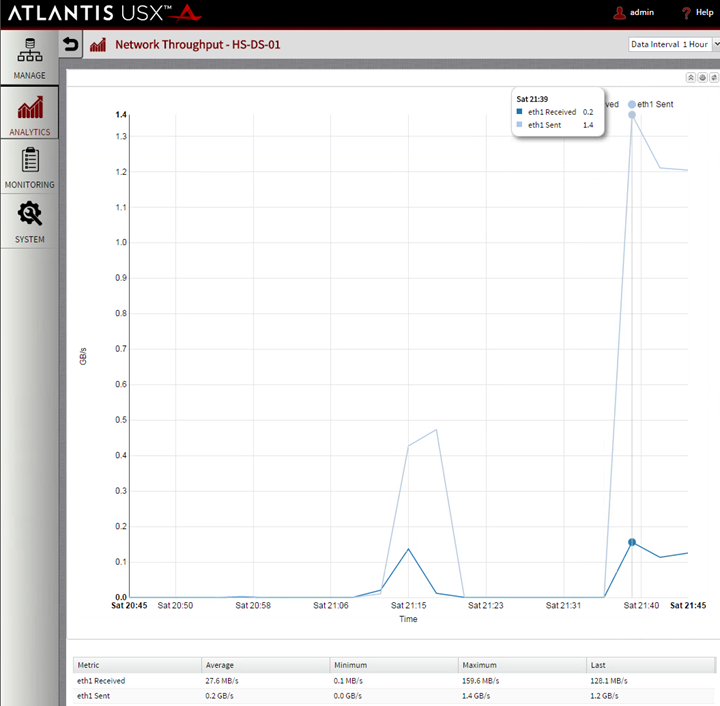 In short, Atlantis shows over 20TB of provisioned space (includes savings from thin provisioning and deduplication), while consuming less than 250GB of storage across all the CachePoints. Wow, truly remarkable. 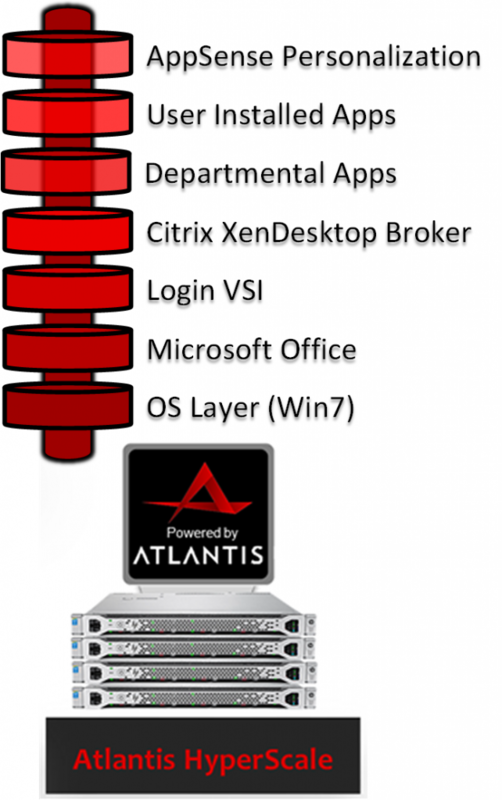 Atlantis further reduced the overall capacity requirement by providing de-duplication for Unidesk OS and Application layers, User layers, and VM files (page, swap, etc.). Obviously where Atlantis deduplication will shine is when we consider growth over time as unique and non-unique user and application data is transferred into the persistent desktops. 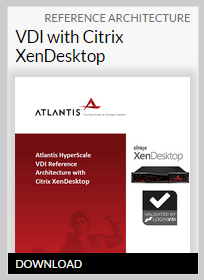 Based on the information and testing data I’m seeing from initial deployment, I’d be hard pressed to think of any typical Unidesk customer selecting Atlantis HyperScale would ever run out of space. Another reason why All-Flash, when priced competitively, is the clear winner for End User Computing and Hyper-Converged Infrastructure deployments. Raw performance at a price you can afford, doesn’t break the piggy bank in the process of delivering mind blowing user experiences. 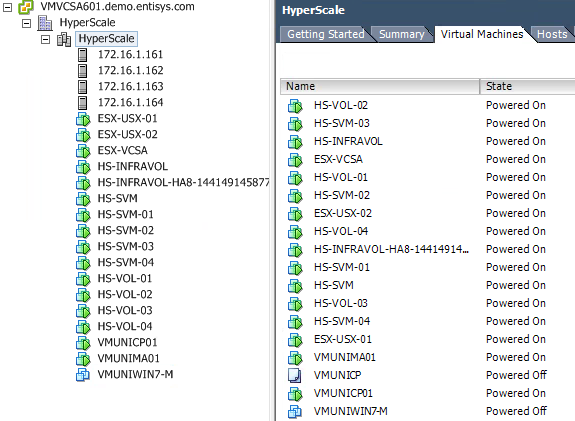 If nothing else, I suspect that existing Unidesk customers with known workloads would be able to use HyperScale as a reference architecture for a build-your-own hardware/software configuration optimized for USX. If done correctly, this could prove to be an opportunity to lower the entry point even further by reducing internal SSDs (currently 3x 400GB Intel SSDs per server in the CX-12) and USX capacity requirements where appropriate. This blog post should serve as a good reference for HyperScale, but it’s not to say custom hardware Bill Of Materials (BOMs) with USX results would be vastly different. I suspect results with build-your-own configurations would not be much different and would give customers opportunities to use alternate hardware configurations including denser compute hardware that typically has local storage constraints (High Performance Computing, Blades, etc.). Or, hardware platforms that allow the use of NVIDIA, AMD, or Intel Graphics Processing Units! While Unidesk doesn’t directly support GPUs/vGPUs through their user interface today, for Persistent desktops, drivers can be injected as an Application Layer and GPU/vGPU profiles can be attached via scripts. The options are truly endless. Observed network traffic during disk replication process from Master CachePoint to additional CachePoints is quite impressive! 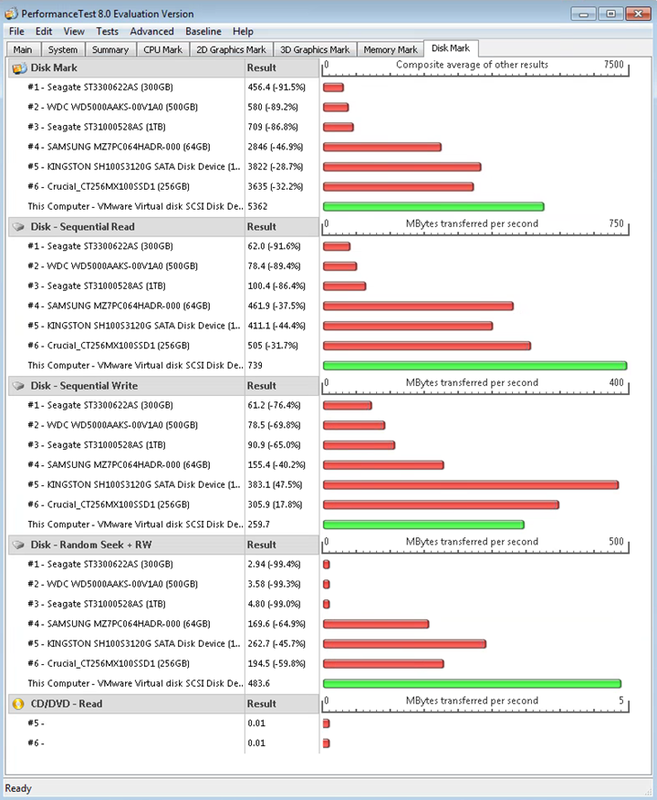 Incredible VSIbase of 790, classified by Login VSI as Very Good performance! 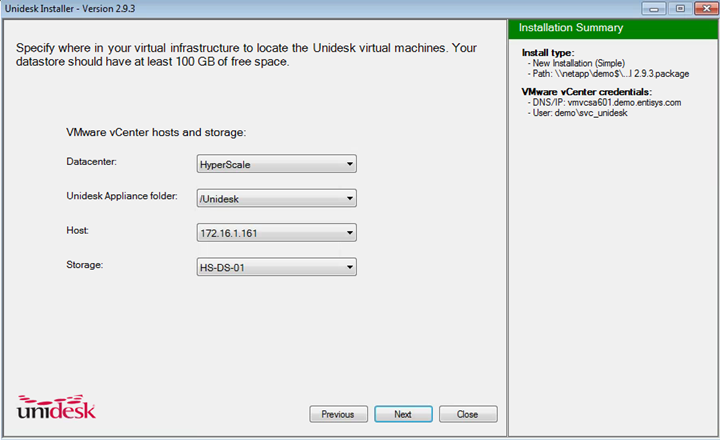 I hope you’ve enjoyed this blog post and that it serves as a reference for integration and implementation of Unidesk for vSphere with Atlantis HyperScale and USX! If you have any comments, questions, or just want to leave feedback, please feel free to do so in the comments section below.